For example, don't just say that you want to hit the gym more often. Determine that you've got the time to go at least twice a week at 6:00AM (or whatever) and make it happen. Don't just say that you want to become a runner. Find a training plan for a 5K race, one that you feel comfortable with, then research and sign up for a suitable 5K race. I'm still not quite sure what my fitness resolutions/goals for 2013 will be. You can expect a post on that in the very near future. Until then, I wish you all a wonderful weekend. 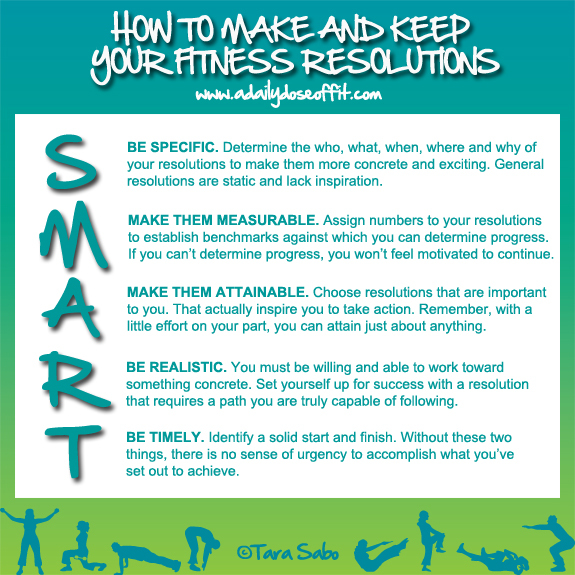 Question: What are your fitness resolutions for 2013? Tell me below and set them in stone! Thanks, Laura! Feel free to share it as you see fit. I'm all about spreading the positivity! 1,000 miles...that sounds awesome. Go for it, girl! LMFAO! Totally posting a SMART post on Tuesday! Oh my, but I have special guests involved, LOL!! Um, well then I guess our posts will be different?! Great minds think alike?! LOVE IT. You totally have to get your Spinning certification. If you've been Spinning at all, it'll be no problem. (FYI: The exam is open book...I didn't get a single question wrong!) Keep me posted!! !